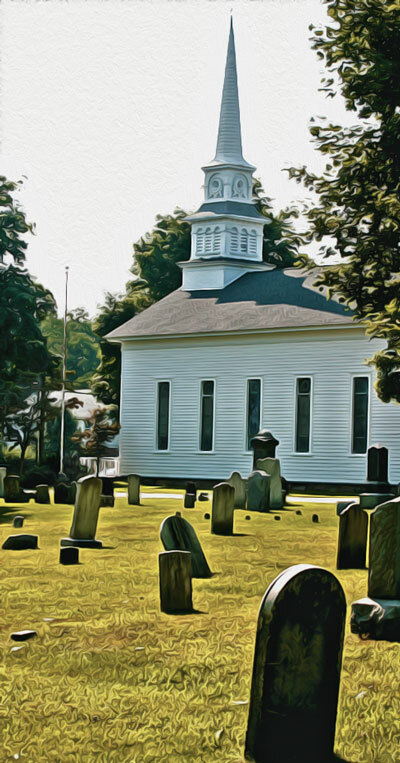 The history of worship in Morris County is older than the county itself. Established in 1739, the county had been home to settlers in the eastern regions since 1695. Settlements in the western portion came soon thereafter, in the early 1700s. And the building of churches began. The many denominations represented in each and every town today offer diverse options for modern worshippers. However, when people were few and far between; when roads were mere footpaths; and when preachers were scattered far and wide; "local" services served the needs of everyone, no matter what denomination they professed. As the population grew, and the communities could support their own ministers, churches proliferated. An assortment of denominations began to establish themselves. One of the oldest churches in the county was built in 1718. Although the original building is no longer standing, the circa 1834 church at Route 10 and Whippany Road serves an active congregation. The First Presbyterian Church of Whippany can trace its roots back to the earliest Morris County settlers. Likewise, many of today's congregations in the western part of the county can claim a heritage traced to the Roxiticus congregation, circa 1738. 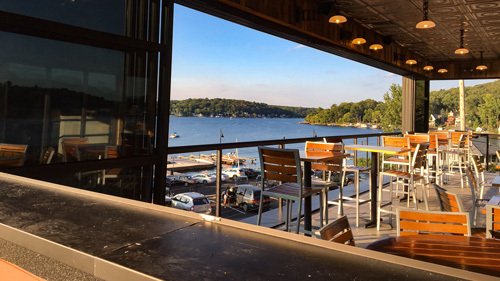 Roxiticus is no longer a name of a place in Morris County. It was an Indian name, given to the region including today's Mendham and Chester Townships. Here, along Route 24 in the area now known as the Ralston section of Mendham Township, the Roxiticus meeting house was built. This log structure, built in 1738 and no longer standing, was crudely constructed. Without window glass, heat, or any decorative touches, it fulfilled the spiritual needs of its worshippers, but not much else. Congregants traveled from today's Chester, Mt. Olive, Mendham, and Roxbury Townships to attend services. Roads were simple paths through the wilderness, and getting to services and back was a daylong affair. In 1740, a "great revival" took place in a barn in Bernards Township, and 3,000 people from all over the region were said to have been in attendance. It is soon after this revival that the Roxiticus congregation began to have discrepancies over church policy, and the decision was made to form another church. The "Hilltop" church, as it is affectionately known, was established in 1745. It is located at 20 Hilltop Road, Mendham. There was no Mendham then, only a wayside inn known as the Black Horse. 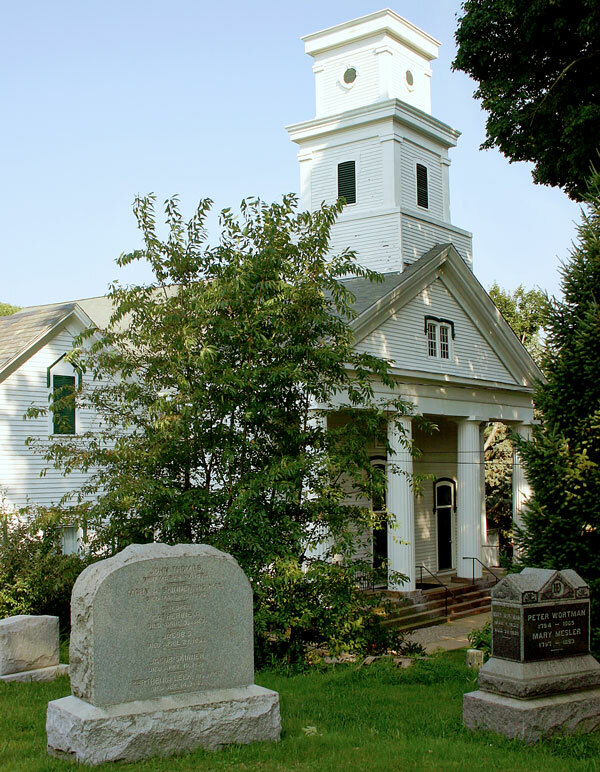 The church founders established the place name of "Mendham", and the town, founded in 1749, ultimately grew around the church. The present building, circa 1860, is the fourth church erected on the site. The first church was replaced by the congregation in 1816, and the next two both were destroyed by fire. 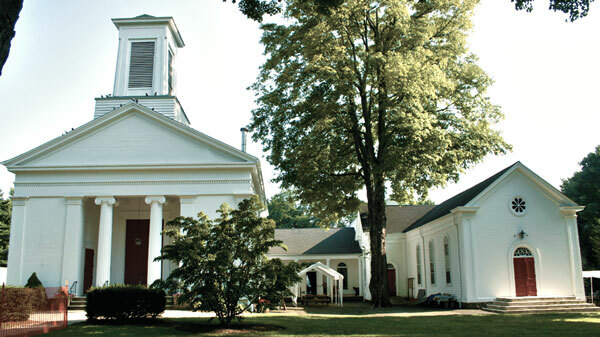 The New England style church sits majestically on its hilltop, with a lighted tower and numerous elegant windows reflecting back to the time when Mendham was a quiet rural village. The second offspring of the Roxiticus church was the First Congregational Church of Chester. After the split from the Presbyterian faction of the Roxiticus worshippers, the congregants established their own organization in 1747. They ultimately built their current church in 1856. The building, in Greek Revival style, boasts an 1873 organ and beautiful tromp l'oeil paintings. The chapel was built in 1873. The Hilltop Presbyterian congregation was still serving the outlying areas in 1750, when permission was sought to establish another Presbyterian church in a more convenient location for those further west. The First Presbyterian Church of Roxbury was built along today's Pleasant Hill Road, Chester Township, in 1750. The road, then known as the "Landing Road", was the main route continuing on to the Suckasunny Plains and into Sussex County. The congregation erected a new building at this site in 1825, providing more amenities than the earlier log structure. Drawings of this "Hill Church" show a modest frame building with double entry doors and numerous windows. These early buildings were believed to have been in the southwest corner of the cemetery property, and no longer exist. 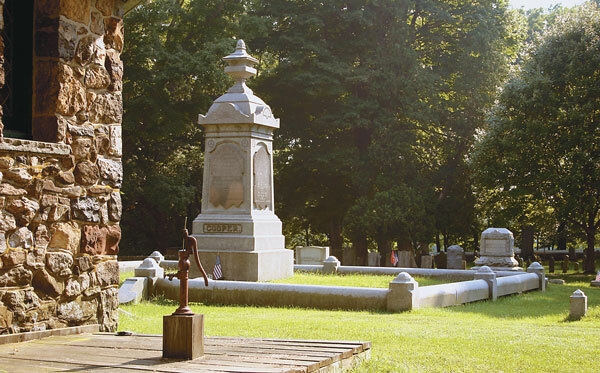 The cemetery here, still in use but no longer owned by the congregation, contains the graves of some early prominent citizens, including General Cooper and his family (Cooper's Gristmill). The congregation became known as the First Presbyterian Church of Chester, and moved from this site around 1851. The current stone chapel located at the entrance to the cemetery is circa 1903. Meanwhile, while still at the Pleasant Hill site, the congregation again split into two factions. The First Presbyterian Church of Succasunna, built on Main Street in Roxbury Township circa 1760, was the result of this division. During the Revolutionary War, this church, along with the churches at Mendham and Chester, was used as a barracks and hospital for the soldiers. The smallpox epidemic left many soldiers buried in these graveyards. Interestingly, the ministers of Morris County emphasized the need for their congregations to be inoculated against the dreaded disease. Few citizens became ill despite the presence of the sick soldiers. The current church building, erected in 1853, was enlarged in 1872. It is said that the cornerstone contains relics from the earlier church building on the site. The Eliza Stoddard Memorial Chapel, circa 1887, was erected in honor of this young girl, who is said to have shown an uncanny devotion to God. She died in 1886, at the tender age of 16. Back in Chester, the Presbyterian Congregation relocated from Pleasant Hill Road down to the center of the growing town. The Community Presbyterian Church of Chester, at 220 Main Street, was built circa 1852 in the Greek Revival Style which was popular at that time. The chapel, circa 1872, is connected by a modern addition. It is interesting to compare the First Congregational Church of Chester, the Presbyterian Church in Chester, and the church of the Succasunna Presbyterians. All three were built in the 1850's, and all three have chapels added in the 1870's. This reflects the growing population and prosperity of the area. Remember, in early days the congregation had to raise money to build its church and the parsonage, and to support its pastor. A popular way of doing this was to "auction off" the church pews, with the best seats going to the highest bidders. The last rows were left open for the general public. Of course, this usually meant that the most prominent families had front row seats at each sermon! It was also common for churches to share ministers in hard times. This happened both within and across denominations. The Presbyterian churches of Succasunna and Chester shared preachers during the American Revolution. Later, other local congregations shared buildings and pastors, as we shall see. The Mt. Olive Presbyterian congregation officially left the Chester church in 1838, while still at Pleasant Hill. However, prior to this there had been an old log church erected for use of all denominations in the Mount Olive area. This structure was an "outpost", used only occasionally. 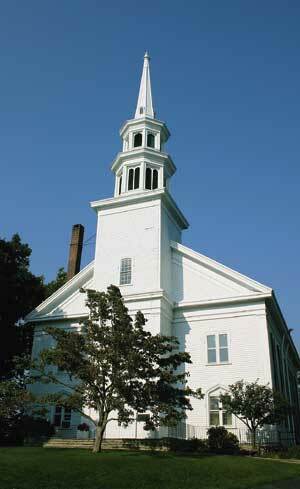 In 1809, a new building to be used jointly by the Presbyterians and Baptists was constructed. By 1852 the Mt. Olive Presbyterian Church was built. It is located alongside the Mt. Olive Baptist Church, at the old Mt. Olive Village site, on Flanders-Drakestown Road. The building has been converted into a unique private home. The historical marker at the site provides information on the old village. The Baptist meetinghouse, circa 1855, is in excellent condition although no longer in use. The Mt. Olive Academy, a stone building circa 1837, is also located here. The next group to diverge from the Chester congregation was the Flanders contingent. Their 1852 original church building was destroyed by fire in 1901. This led to the Methodist congregation of Flanders loaning the Presbyterians the use of their church for services until a new church could be erected. 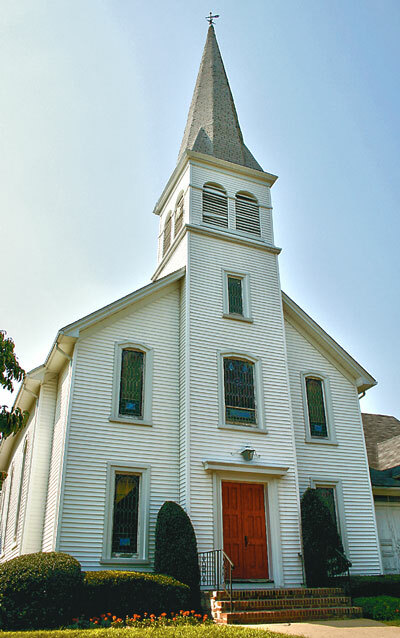 This new church, circa 1905, is located at 76 Main Street, Flanders. It is now home to the Calvary Bible Chapel. The Flanders congregation again combined services with the Flanders Methodist Church from 1930-1957, due to a decline in the area's population and depressed economic conditions. The two united briefly as the "United Church of Flanders". 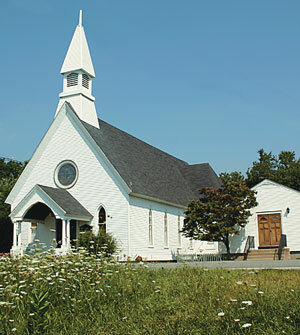 Summer services were held in the Flanders Presbyterian Church, which had no heating system. The Flanders Methodist Church held winter services which both the Mt. Olive and the Flanders Presbyterian congregants attended. In 1960, these two Presbyterian churches permanently merged. The Flanders Presbyterian Church became the active site for services, and the Mt. Olive church served as home to the Pax Amicus Theater group prior to becoming a private home. The Flanders United Methodist Church still actively serves worshippers. Lastly, in 1874, the Budd Lake Union Chapel, located on Sandshore Road, in the Budd Lake section of Mt. Olive Township, was built. Its land was deeded solely for the establishment of a non-denominational church, by John Budd 2nd. This branch of the Budd family descended from John Budd of England, who came to America in 1637 seeking relief from religious persecution. The original owner of this and surrounding lands was his great-great-grandson, the Revolutionary War Colonel John Budd 1st. The Budd family had attended worship services in Chester. 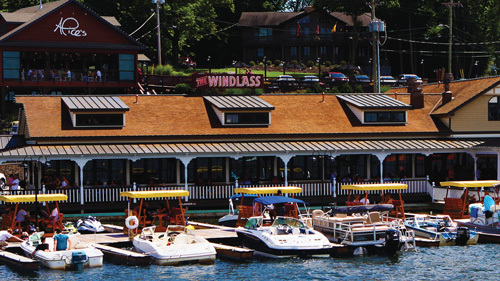 Budd Lake was becoming a popular resort town, and the Union Chapel would be able to serve the spiritual needs of the Budd family, other area residents, and visitors alike. The Budd Lake Union Chapel today consists of the original building, expanded in 1928, as well as the attached "Faith Hall". The building features numerous stained glass windows and a large, circular window above the entry. 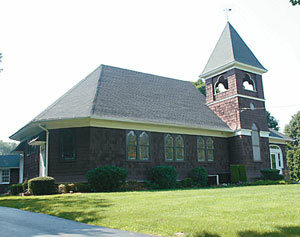 The diminutive Faith Hall was originally an Episcopal Church slated to be demolished during the construction of Route 80. In 1960 it was purchased by the congregation to serve as Sunday School rooms, and moved to its current site. The Budd Lake Union Chapel has undergone many different phases through the years. At one time, the famous Schooley's Mountain House Resort provided luxury carriage rides to its guests wishing to attend services at the Chapel. At some point, year-round services were suspended, and only summer sessions were offered do to lack of participation. Following WWII, the church again experienced a period of growth, but by the 1970s had declined to seven members! Pastor Rupprecht, currently serving the congregation today, is credited with revitalizing the church and making it the vital, thriving community it now is. Religion in Morris County today is diverse and plentiful. Numerous denominations are well-represented in almost every town. The architecture of these places of worship ranges from churches on the National Register of Historic Places to contemporary visions of avant-garde design. Should you take our church tour, remember that many of the roads on which you will travel are built upon the early footpaths of the American Indians, and the wagon-trails of the first settlers. Notice also places of worship not mentioned in our brief history. 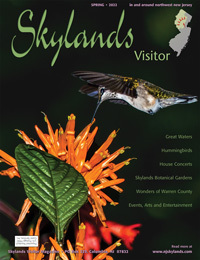 These too have roots in the past, in the development of our communities, and in the heritage of Northwest New Jersey. An autumn Sunday afternoon drive through western Morris County reveals extraordinary beauty in these grand country churches. Beginning in Mendham Boro, on Route 24, (Main Street), turn at the Black Horse Inn onto Hilltop Road. Turn left at the crest of the hill, onto Talmadge Road, where the parking lot for the First Presbyterian Church is located. As you drive this route, remember that this church served worshippers as far away as Roxbury Township and Mt. Olive, when the fastest mode of family transportation was a horse and carriage! Community Presbyterian Church on Main Street in Chester. Continue until the traffic light at Chester Boro, where you will make a left turn onto Main Street. The Community Presbyterian Church of Chester is located on the left. This is the second home of the Chester Presbyterian congregation, after their move from the Pleasant Hill site to the downtown location in 1852. This portion of Main Street was not in existence until after the town began its main development around 1800. The original road detoured southeast behind the current Main Street, along Budd Avenue, and continued onto today's Hillside Road, where we are headed next. Travel through town and turn right onto Hillside Road. There are mine tunnels and shafts far underground here, part of the legacy of the Chester iron mines. Hillside crosses the old railway bed soon after you turn off of Main Street, and the Congregation Church is on the right. This group divided from the original Roxiticus Church and established themselves in 1747, just before the Presbyterian faction, based at the Hilltop Church in Mendham, separated to form the Roxbury (now Chester) congregation. At the "Y" intersection, bear right. This is now Pleasant Hill Road. This was part of the Landing Road, which led to the "Suckasunny Plains", and into Sussex County. Follow Pleasant Hill Road across the Black River and up the hill, where you will see the Pleasant Hill Cemetery on the left. It is here that the Presbyterian congregation was located from 1750 -1852. Continue straight past Welkind Rehabilitation Center, and stay right around the sharp curve. Look for Reger Road on your left, and then be alert for the next "Y" intersection just ahead. You will bear LEFT to continue onto Pleasant Hill Road in Roxbury. (Straight puts you on Ironia Road. Should this occur, continue on until Golf Course Road, a left turn. 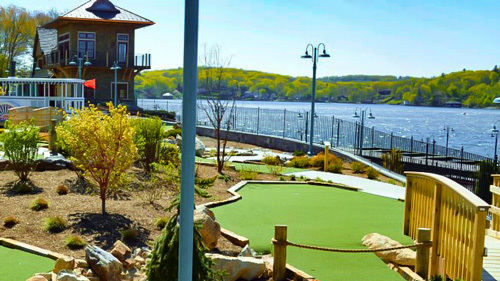 You will rejoin Pleasant Hill Road, Roxbury Township, at the end of Golf Course Road). At the Yield sign, bear left. At the stop sign, turn right onto Eyland Avenue, and proceed until the intersection of Route 10 several miles down the road. Cross straight over the highway, and turn left at the stop onto Main Street, Succasunna. The First Presbyterian Church of Succasunna is on the right, next to the Succasunna United Methodist Church. Both churches and their cemeteries are important pieces of history in this region. Mahlon Dickerson, the first governor of NJ, is buried at the Presbyterian cemetery. The Methodist Church is circa 1852, with the "L" addition in 1891. Continue on Main Street to the light at Hillside Avenue. Turn left and proceed straight back across Route 10. Follow Hillside Road, bearing right at the intersection with Eyland. Turn left onto Main Street, Flanders, at the United Methodist Church. This church, circa 1857, shared services with the Presbyterian congregation several times in the early 1900's. Continue to the stop sign and turn left. The Calvary Bible Chapel now occupies the 1905 building erected by the Flanders Presbyterian congregation. The current Flanders United Presbyterian Church, of modern vintage, is on Drakesdale Road. Bear right at the intersection and travel to the light on Route 206. Proceed directly over the highway. At the stop sign, turn left. Make the right onto River Road, and continue until Flanders-Drakestown Road on the right. Follow until just prior to the intersection with Mt. Olive Road, and the historical marker and buildings of Mt. Olive Village will be on the left. The private home to your left was the Presbyterian church, circa 1852. Turn left onto Mt. Olive Road, take Route 46 westbound, and proceed to Sandshore Road, on the right. The Budd Lake Union Chapel is on the right. Turn onto the side street alongside the Chapel for parking, and to proceed back to Route 46. From here, Route 80/206 interchanges can be accessed, via Route 46 eastbound, several miles down the road.